With its spectacular landscapes, warm climate, Navajo heritage, and numerous kid-friendly resorts, Arizona offers so many great things to do on family trips. Here's a sampling of the best places for families to stay in the Grand Canyon State. Located just 15 minutes from the Phoenix airport, the Arizona Grand Resort has its own private seven-acre Oasis Park, which features three water slides, a 10,000-square-foot wave pool and lazy Zuni River—and that's in addition to the resort's six swimming locales spread across the resort grounds. Nestled in the foothills of the Santa Catalina Mountains outside of Tucson, the Hilton El Conquistador Golf & Tennis Resort offers tennis, golf, hiking trails, stunning desert mountain views, and a number of on-site restaurants. For families, the kicker is the Desert Springs Oasis pool area, complete with a 143-foot waterslide, and a splash pad for younger kids. You can also relax in the hot springs and a waterfall-fed cold plunge. Founded in 1868, the all-inclusive Tanque Verde Ranch in the Sonoran desert outside of Tucson offers all the horseback riding you want plus a spa, swimming pool, tennis and basketball courts, mountain biking, and age-staggered children's programs for kids ages 4 to 12. Twenty minutes from the Phoenix airport, the JW Marriott Desert Ridge Resort & Spa offers four acres of pools and water park features including a waterslide and a 1600-foot lazy river. There's a fantastic spa and two golf courses, too. 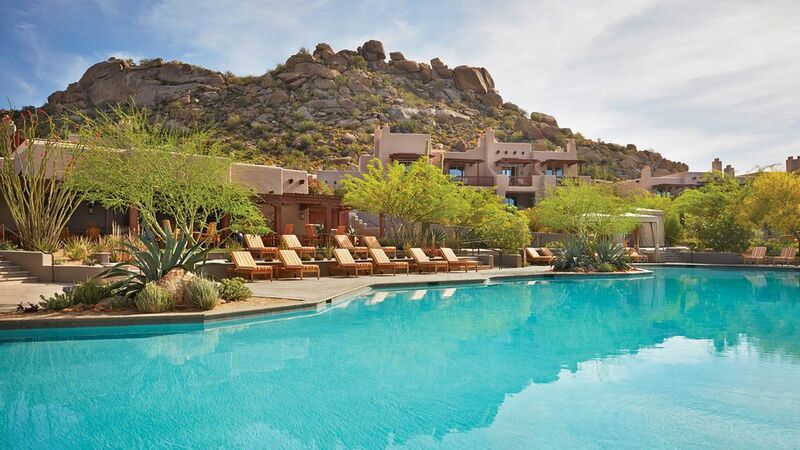 The Wigwam resort near Phoenix is upscale and unabashedly family-friendly, offering plush adobe-style casitas, swimming pools, a waterslide, and more. Plus, the hotel holds Camp Wigwam for kids on the weekends in the summer, which allows children to participate in activities such as obstacle courses, movies at the pool, and more. Properly plush and yet kid-friendly, the Fairmont Scottsdale Princess draws families with five lagoon-style pools and waterslides, dive-in movies, and a kids program for ages 5 to 12 (for a fee). This is Arizona, so naturally, there's also a spa and two championship golf courses. The Hyatt Regency Scottsdale Resort & Spa at Gainey Ranch wows families with its oasis-like setting, Camp Hyatt kids club, and 2.5-acre water playground that includes a sand beach, 10 pools, and three-story waterslides. Located in the desert near Tucson Mountain Park, the JW Marriott Starr Pass Resort has been named to Travel + Leisure magazine's World’s Best Hotels Top 500 and appeals to families with its pool complex complete with a lazy river and waterslide, kids' programs, and terrific hiking and other outdoor activities. Feel like splurging? Four Seasons Resorts Scottsdale at Troon North is a secluded luxury property known for exemplary service and pampering. That pampering extends to pint-sized visitors, who get their own child-sized bathrobes, kids' menus, and complimentary kids' program for ages 5 to 12. A historic landmark, the Arizona Biltmore is an upscale Phoenix property with kids programs, family activities, playground, pools and a waterslide.